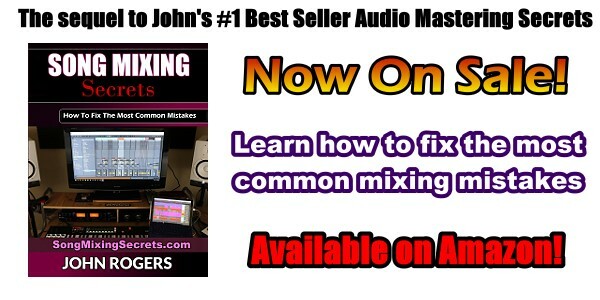 In music mixing, you're "mixing together" multiple audio tracks to make a single audio file song. Different tracks like the lead vocal, bass line, guitars, drums, etc. are being combined together. Then proper effects (like EQ, reverb, delay) are added to each track, along with panning and volume adjustments. In the final step, all tracks are exported simultaneously to create a song in the form of a single stereo interleaved .wav or .aiff file. In audio mastering (as mentioned in the previous section) the entire song is affected by effects processes, not individual tracks. At least once a week, someone uploads a song .wav file and says they want it mixed and mastered. Well, you can't mix one file. The word "mixing" is a verb and you need at least two tracks (files) to be able to mix them together. You need at least two of anything to be able to mix it together! A music DJ is a good example. If he had only one record, he wouldn't be doing any mixing. He could throw some scratches in, but that's it. Can Anyone Become A Great Mastering Engineer? Can You Mix And Master Music With Tinnitus? Does Radio Ready Mastering Exist? How Did I Get My Tinnitus And How Did It Sound? How Loud Is Too Loud When Mixing And Mastering? Should Your Mixes Sound Close To A Mastered Song? What Are Mid-Side Effects Processors? What Is A/B Comparison Listening? What Is Headroom For Mastering And Dynamic Range? What's The Main Goal In Audio Mastering?